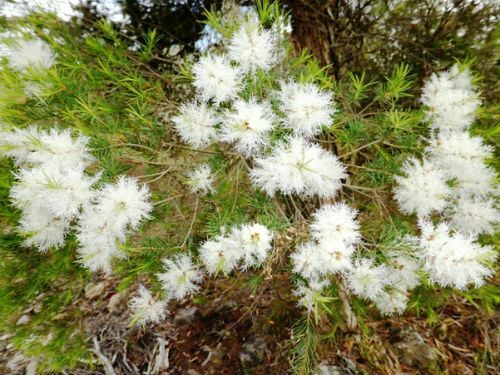 Melaleuca alternifolia is a tall shrub that reaches a height of seven metres. Bark is papery and peels away in strips. Foliage is light green and aromatic. 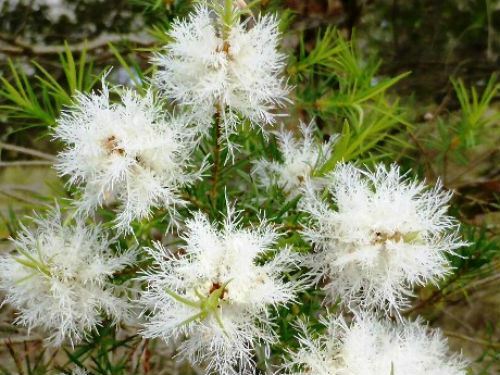 Valuable Tea Tree oil is extracted from the leaves. White flowers are carried in many flowered spikes and are profuse and conspicuous. In our cold climate garden plants are crowned with the flowers in summer. Many insects visit the blooms. The specie’s common name is Snow-in-Summer and refers to this floral display. M. alternifolia shares this common name with M. linariifolia. M. alternifolia copes with both moist and dry situations. Snow-in-Summer occurs on the North Coast and Northern Tablelands of NSW as well as southern Queensland. M. alternifolia was originally considered to be a variety of M. alternifolia. The type was collected between Coffs Harbour and Grafton, NSW in the early 1920’s. A tall, colourful hedge could be created by growing alternate plants of both Snow-in-Summer species.